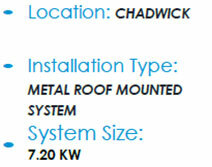 WCP Solar was contracted to design and construct a residential roof mounted solar system located in Chadwick, Illinois. This grid connected system ties directly into the Jo-Carroll Energy Utility’s (JCE) power grid and generates enough electricity to provide power to more than 83% of the home electrical needs. The project was sized at 7.20-kWp1, using 24 Canadian Solar photovoltaic panels rated at 300-W mounted on a 30 degree tilted roof. The system also employs 24 Enphase M250- Microinverters to convert the DC energy produced by the solar System into AC energy. WCP Solar also installed a 16Kw standby back up Generac Generator resolving any future grid power outages. 1 Estimated production of over 226 Tons of CO2 - Equivalent to Planting over 5265 trees or driving reduced by 452,000 auto miles, or 23,072 gallons of gasoline.